In today’s home construction many designers, contractors, and homeowners are opting for more sustainable materials in an effort to better protect our environment. With this in mind, there are many more options available now that is considered eco-friendly floors. Some of these are new concepts and some have been around for ages. Let’s explore what is available and what makes these flooring products environmentally friendly. For some time now bamboo has steadily been gaining in popularity as a desirable flooring choice. Unlike forested trees, bamboo is a very fast growing grass, considered an invasive weed in some areas because of how quickly it matures and takes over a landscape if not controlled. One way to control it is to harvest mature stalks and use it as finished surfaces in home construction. It behaves similarly to hardwood as a flooring surface, and comes in planks or boards. It has varied grains and can be stained and sealed and is a very durable material. Concrete has been around for thousands of years in various forms and is a versatile building material. It is extremely strong and resistant to staining after it has been sealed. While it has an industrial aesthetic, it is extremely practical, insect resistant, non-toxic, and hypoallergenic. It is best installed in slab-on-grade construction. Today’s concrete can have pigments or aggregates added to offer a variety of colors and textures. Once down, it should last for several decades and is so easy to clean and maintain. Another cool benefit of concrete is that you can easily embed radiant floor heating systems into it, reducing the exposure to dust from ducted air. Also known as reclaimed lumber, salvaged wood flooring is wood that has been removed from older homes and barns to be reused in newer construction. The beauty of this flooring option is that it protects our forests from being overly harvested. Salvaged wood can look really nice in a traditional home or cottage and provides a rustic look. The planks are generally wider and stronger than today’s floorboards, as they were likely cut from old growth timbers. Linoleum is not to be confused with vinyl flooring. Linoleum is a hypoallergenic product that is linseed oil based with other natural materials mixed into it, many of them recycled or by-product content, such as saw dust. The color options are also endless. Linoleum feels soft underfoot and is kind to things that are dropped on it. Linoleum is easy to clean and requires very little maintenance and is available in both tiles and sheets for easy installation. Cork is another product that has been around for a very long time. It has mostly been used as wine bottle corks (hence the name), as insulation behind brick veneer, and as a sound deadening wall surface material. It is mainly harvested from the cork oak trees grown in Spain and Portugal. The advantage to using cork is that the trees will grow new bark, making it a renewable resource. 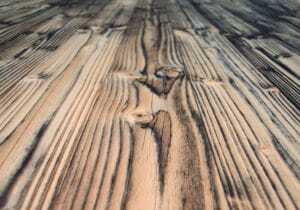 It can be finished similarly to wood with a variety of stain colors and low VOC sealers. There are so many flooring options available that are considered “green” these days. As well as being environmentally friendly, they are healthier options for your home and family. If you have your heart set on classic hardwood floors, make sure you choose wood that is sourced from an FSC (Forest Stewardship Council) certified producer. Guest post by MacDonald Hardwoods, a Denver-based hardwood flooring company with over 30 years of experience. MacWoods can help with choosing floor species that works for your home, from oak to bamboo to pine flooring and more. Is the Tiny House Movement for you? Flor is an eco-friendly option for your floors.